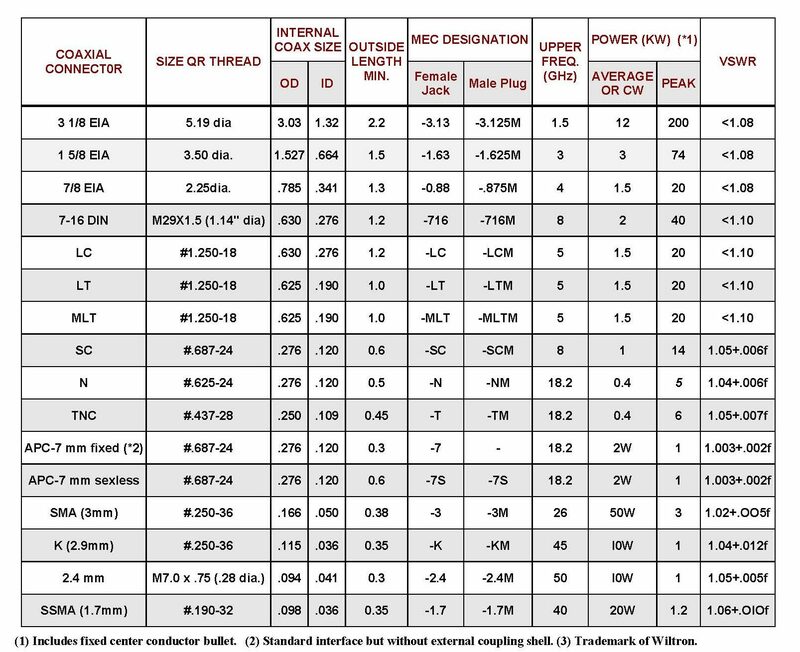 This page describes M.E.C.’s most commonly used 50 W coaxial connectors. The C30 series are well matched transitions between any two of these connectors and are optimized based on given frequency, power level, and other requirements. These units are commonly used for precise RF testing and in high power applications. Besides transitions, M.E.C. 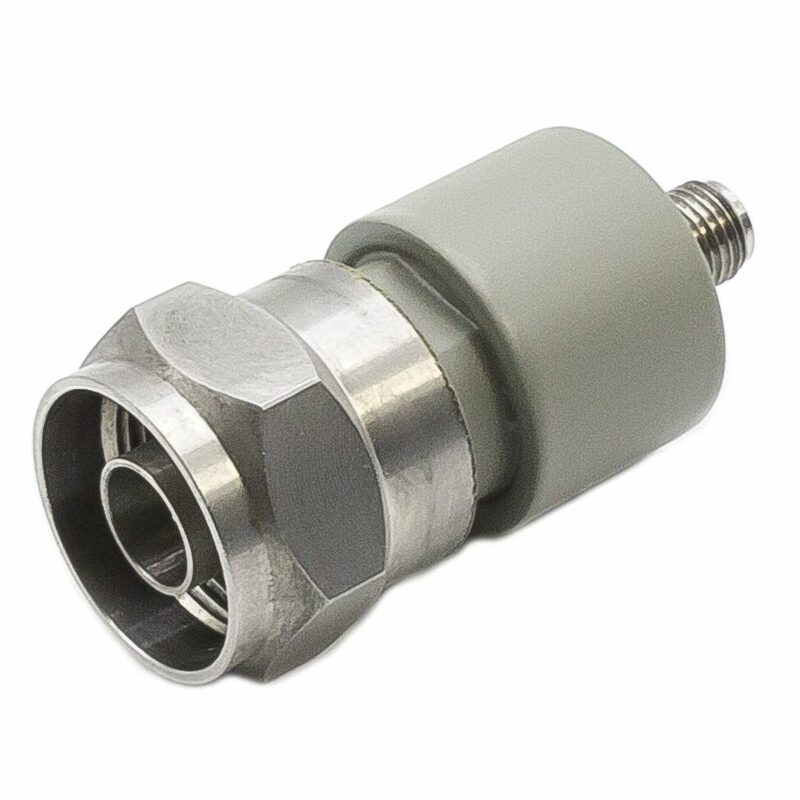 incorporates these connectors in other components described elsewhere, such as waveguide to coaxial adapters, couplers, mismatches, and terminations. Since M.E.C. designs and manufactures these connectors and transitions directly into the end product, we offer our customers flexibility to optimize frequency band, VSWR, loss, power handling, or pressure requirements without being limited by a set of fixed configurations. Column 1 gives the common designation for the connector. Column 2 gives the external coupling thread size or the diameter of the standard flange for rough size information. Columns 3 & 4 give the M.E.C. designation for the female (jack) and the male (plug) configurations. Column 5 shows the normal upper frequency of operation above which higher order modes may propagate causing spikes in the transmission and reflection. In some cases operation above this limit is possible using special mode suppression techniques in coordination with the customer. Columns 6 & 7 provide the maximum continuous or average power and the maximum peak power through the connector at standard temperature and sea level pressure. These figures are approximate and for reference only. Exact power specifications depend on environment, mounting, cooling, and configuration and must be analyzed individually. Column 8 gives connector VSWR versus frequency (in GHz) from DC to the upper limit in Column 5. (1) COAX-TO-COAX TRANSITIONS: Use C30-X-Y where C30 is the coaxial transition series, “X” and “Y” are the suffix as of the larger and smaller connectors respectively. Example a C30-7-T is a transition for APC-7mm to TNC-Jack. (2) OTHER COMPONENTS: Use the series number of the components required and add the suffix for the connector required. For example, an R40-3 is a WRD750 to SMA-Jack adapter (see R40 Series). (3) When placing an order, other requirements such as frequency band, power handling, VSWR, etc. should also be given. M.E.C. will, if necessary, issue a unique 3-digit suffix to the model number to encompass customer specifications.